The most recent DC animated movie features excellent animation, well-choreographed super fights and amazing action. 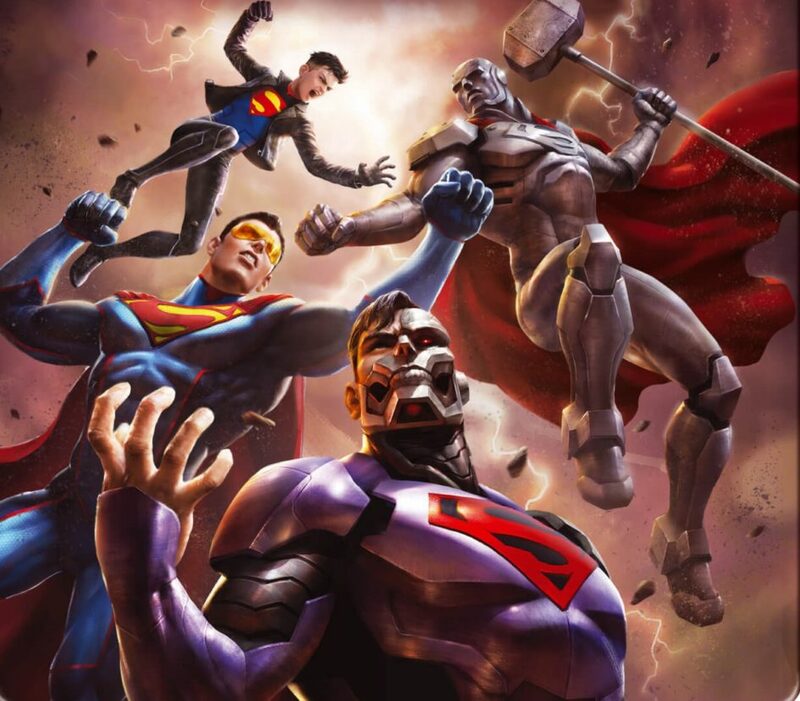 Its solid story does a fine job of juggling the four Supermen — Steel, Superboy, Cyborg Superman and The Eradicator — who would fight to take Superman’s place after his death. Now out on Blu-ray and digital release, I saw Reign of the Supermen in a theater as part of an event and would say it’s definitely worth the watch. While I knew who Steel and Superboy were from comic books and television, I’d never really had a good handle on characters like Cyborg Superman or The Eradicator. Indeed, trying to read or follow the backstory of The Eradicator from the comics is enough to make one’s eyes glaze over, but this movie does an excellent job of explaining The Eradicator and giving him a great motivation. Clocking in at just 87 minutes long, I was surprised at how well this movie uses its time to establish each of the characters’ stories before pitting them against each other. There’s a spectacular showdown partway through the movie at LexCorp Tower. Each of the Supermen gets to shine and show off their powers. The fight choreography, especially in the air, is visually impressive. Each of the Supermen gets their moment in the spotlight and it’s really cool to watch. The animation in this movie is like the animation found in the DC animated films Justice League: War and Justice League: Throne of Atlantis. While there is a throwback to one of the earlier animated movies, you really only need to watch The Death of Superman before watching Reign of the Supermen. Although if you know that Doomsday killed Superman or vaguely remember watching the 2007 animated movie Superman: Doomsday, you’ll be fine. At first, I thought it was weird that they were revisiting the same material they’d already covered in 2007’s Superman: Doomsday, but the animation and story are much better this time around… as are the supporting characters. I’m particularly happy with the portrayal of Superboy. After seeing so much of the angsty teen in the Young Justice animated series and in recent comics, it’s refreshing to revisit the version of Superboy who was all about fame and fortune, the groupies, the glitz and the glamour… all the superficial reasons to be Superman. It’s great seeing the ’90s-style sunglasses and leather jacket again. The film does update some of his antics — like taking group selfies with flocks of fans — but keeps his use of ’90s terminology and explains it by saying he’s been watching ’90s television (brilliant screenwriting). The movie also leans into the idea of Lex Luthor being like a disappointed dad when it comes to Superboy. I wish we’d see this dynamic more often in comics and shows like Young Justice. Being a fan of Young Justice, it’s weird to see G. Gordon Godfrey telling viewers to be their own superhero. Although Godfrey is still telling people to reject these new Supermen, he’s usually more maniacal about undermining the superhero community — which makes perfect sense when you know who he really works for. Because the movie uses a different alien overlord instead of Mongul (like in the comics) with regards to Cyborg Superman, I think it was a mistake not to put Godfrey constantly behind the cameras, like in Young Justice. It would also have been fantastic if they could have gotten Tim Curry (The Rocky Horror Picture Show, Legend) to reprise the role. While Cat Grant did briefly have a daytime television talk show in the comics during this story arc, she is usually depicted as a gossip columnist for The Daily Planet. She is also very self-centered, superficial and flirtatious… particularly toward her coworker, Clark Kent, much to Lois Lane’s chagrin. TV series like Lois & Clark and also Supergirl have given a more accurate portrayal of the character. In Death of Superman and Reign of the Supermen, they try and portray Cat Grant as some sort of friend and confidant for Lois and it just doesn’t work. Cat is supposed to be a foil for Lois, in the same way that sports columnist Steve Lombard (shown briefly in Death of Superman) is to Clark Kent. Columnists vs. reporters. Watch the animated movie All-Star Superman for a better look at the staff of the Daily Planet. What are these DC animators and creators thinking? Casting different movie or television actresses with little-to-no voice-acting experience in each new movie has not benefited the character. Looking good in front of the camera doesn’t necessarily translate to being good behind the microphone. It’s unfortunate, because the role of Lois in this movie is well-written, but could have been elevated by an experienced voice actor. Dana Delany did such a good job voicing Lois Lane on Superman: The Animated Series and Justice League Unlimited, it’s a shame not to have someone of her voice talent here. But Delany isn’t the only voice actor who I wish had reprised a role they’d done from the aforementioned animated series. I would love to hear Clancy Brown voice Lex Luthor again. I did not think that Rainn Wilson (Dwight from The Office) was the best choice to voice Luthor. Wilson sometimes came across as whiny and annoying, as if his Dwight character was coming through. Lex Luthor should be feared and respected, not just catered to because he’s rich. Luthor, the nefarious philanthropist, the sinister scientist, evil incorporated, the Everyman who’s going to bring down Superman… this role requires the kind of gravitas that someone like Clancy Brown brings to the table. With regards to Luthor, I also hate how Mercy was written and treated. It was too similar to her depiction in Batman v Superman: Dawn of Justice. These are just minor issues that I took issue with. The rest of the supporting cast seemed fine. Charles Halford, who also voices The Eradicator, did a good take on Bibbo Bibbowski. The rest of the Supermen were voiced all right, even though most of them are mostly television actors. The animation is still exceptional. The action is amazing. The story is solid and a great adaptation of that found in the comics. Reign of the Supermen is one of the better DC Animated Movies. It’s worth the watch.